Hernan Cortes de Pizzaro, the conqueror of Mexico. has remained a controversial, yet influential figure for a few hundred years. What doesn’t come up very often about Cortes in the press is the notion that he deserves historical credit for introducing the tomato to Europe. The ships that he sent back to Spain in the 16th century carried tomato seeds that were tested and then cultivated by the Spanish, before finding their way to Italy- where Italy also eventually welcomed tomatoes as an important ingredient in its national pantry. Italy in fact became so enamored with the potential of the tomato, that they created several new varietals within the first few decades of its cultivation there. As their chefs and agriculturists have historically been renowned for being in tune with texture and taste, many of their tomato varieties came to provide excellent flavor, heightening world-wide interest in their overall cuisine. 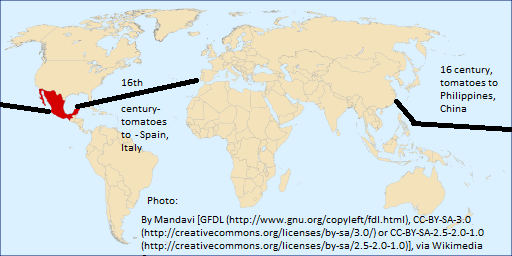 From Italy, the tomato spread eastward to Greece, Turkey, Lebanon, Israel, and Egypt. It didn’t reach some parts of the Mediterranean until the 18th century. Yet today, many of the best-loved traditional dishes from each country contain tomatoes, making it a significant contributor everywhere. Conversely, it is hard for people to imagine some Mediterranean recipes without tomatoes; tabbouleh, for instance, or gazpacho, or a Caprese salad, or most types of spaghetti. On the other side of the globe, Spanish Manila Galleons from the West Coast of Mexico brought tomatoes to the Philippines along with corn. From there, they eventually reached China. Today, China has grown into the 2nd largest producer of tomatoes in the world and tomatoes are as integrated into Asian countries’ diets as they are in other parts of the world. But it is a fruit! When the tomato first arrived in Italy, it was classified as an eggplant. For import purposes in the United States, the tomato has been classified a vegetable, making it more expensive than it would be if it were a fruit. Manufacturers that use tomatoes have helped support legislation that also allowed ketchup to be considered a vegetable. 3 years ago, in the United States, the tomato paste in pizza was also declared a vegetable for health purposes. Recently, Tomatoes were declared the most important vegetable in world trade, meaning that fruits now rule the fruit and the vegetable world. No word on whether vegetables are planning a counter-attack in the marketplace. And which region eats the most tomatoes? Going by recent trends and numbers from World Processing Tomato Council , a manufacturers’ group that among its members comprises over 90 percent of the world’s tomato production, the Persian Gulf region is currently eating almost twice the amount of tomatoes that the next highest region is per capita: over 50 kgs of tomato-based products per year! Article, Wikipedia. “Ketchup as a Vegetable.” Wikipedia. December 10, 2014. Accessed October 13, 2014. Botticelli, Maya. “Truly Med Mex: Margherita Sauce for Spaghetti and Pizza.”Maya Botticelli: Healthy Med-Mex Food. October 4, 2014. Accessed October 12, 2014.